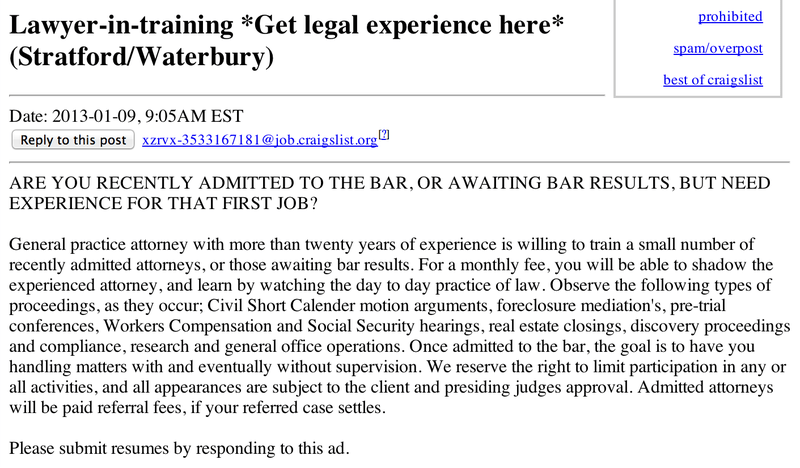 The person who posted this on Craigslist may be an excellent attorney in some ways—I really have no idea. But it looks like one thing he won't be able to teach you is how to write. Most of those are self-explanatory, I think. I also missed one in the headline—unless he's targeting one particular lawyer-in-training, that should probably be plural. This is setting aside the fact that the message as a whole isn't clear because it doesn't explain just what this arrangement is (let alone how much the lucky winner will pay for the privilege). 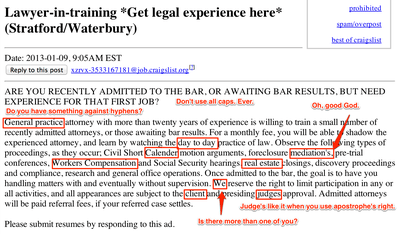 Watching a more experienced lawyer work is one way that new lawyers learn practical skills, it's true. But how many people is he going to reverse-hire? Is he planning to take a large gaggle of new attorneys along to a real-estate closing? (Is there anything to be learned at a real-estate closing, other than where to sign?) 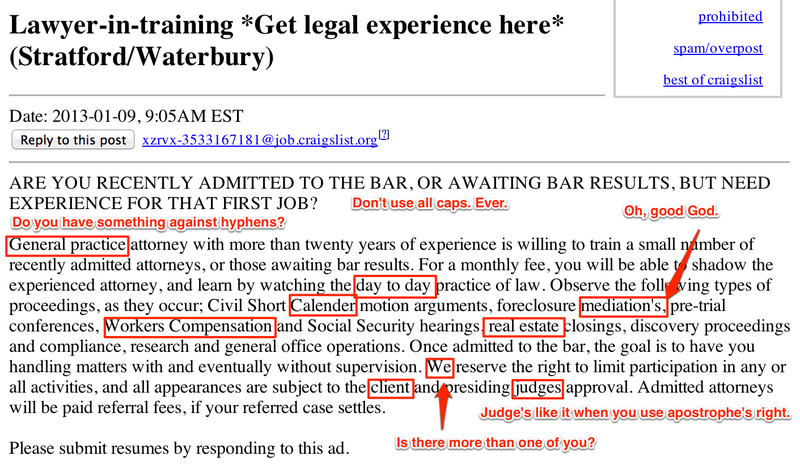 More importantly, this seems to say that the interns (workers? customers?) 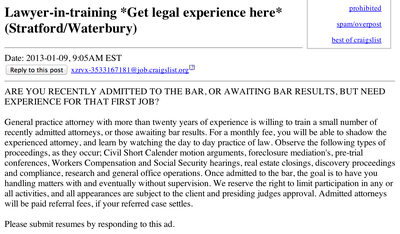 will at some point actually be doing work for the attorney, not just observing. Do they pay for that too? (Maybe the "general office operations" they'll be learning about include payroll, since they'll be paying their boss every month.) And the whole "referral fees" thing at the end sounds a little sketchy. Another thing: he states that "once [you are] admitted to the bar, the goal is to have you handling matters with and eventually without supervision." That generally is the goal in this business, so I don't really see that as a selling point. Anyway, even if you feel it might be worth your while to pay a monthly fee to watch this guy do his thing, please look away quickly if he tries to show you something he's written. Nobody should have to see apostrophes abused like this.